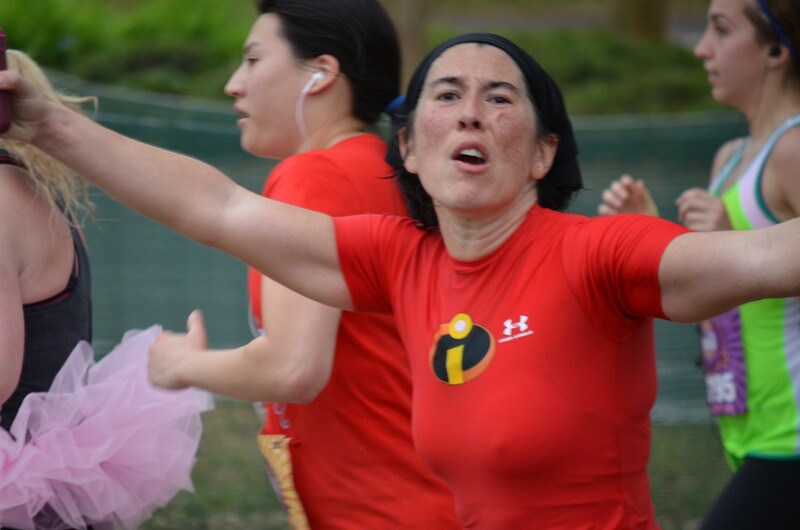 We repurposed the Incredibles costumes we wore last September, which was our plan all along. Unfortunately, my plan was for temperatures to be in the 50s like it had been most of the previous 5 years of this race. Instead it was quite warm. 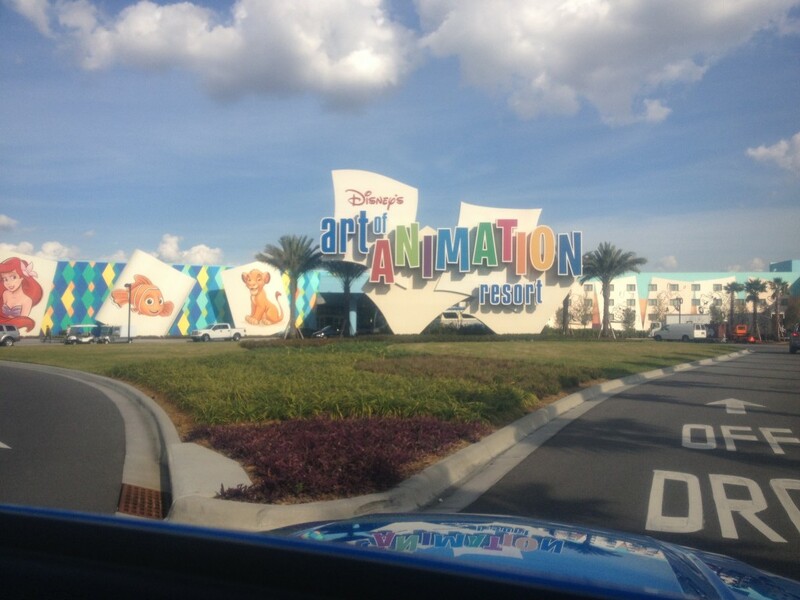 The Art of Animation Resort opened in May 2012. It was originally meant to be an extension of the Pop Century Resort next door, but the concept apparently didn’t fly. 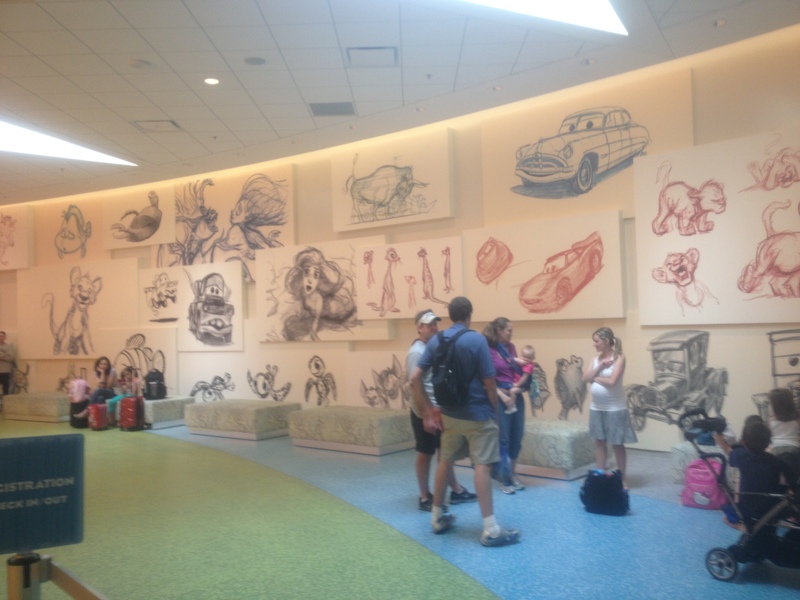 The lobby is so beautiful — storyboards and concept art were all over. 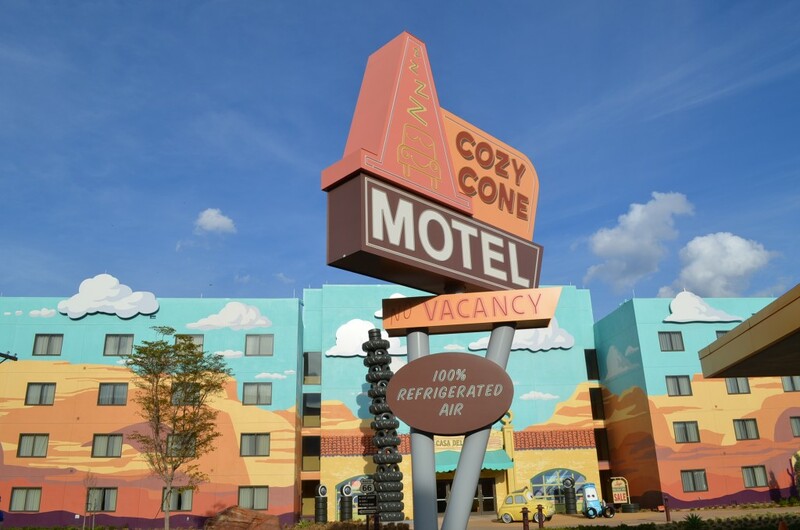 Yes, we were staying at the Cozy Cone hotel. 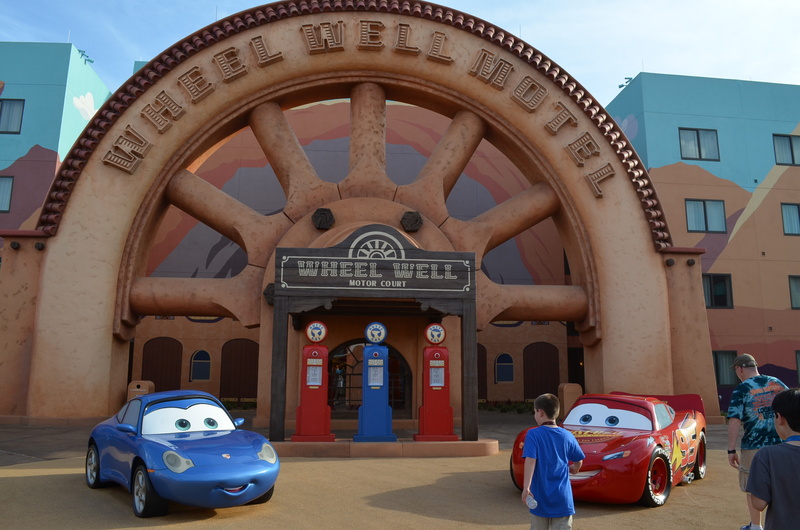 The hotel is divided into four zones, each with a movie theme: Cars, Finding Nemo, The Lion King and The Little Mermaid. The boys absolutely loved staying in this section…although I’d be happy to explore the other themed areas of the hotel, such as Finding Nemo or The Lion King. 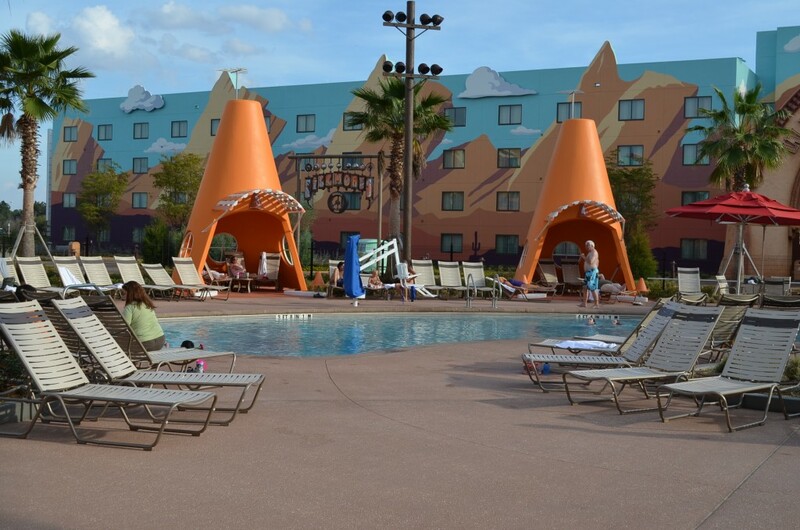 The Cozy Cone pool area. We chose to visit the much-larger Finding Nemo pool, which I’ll discuss later. 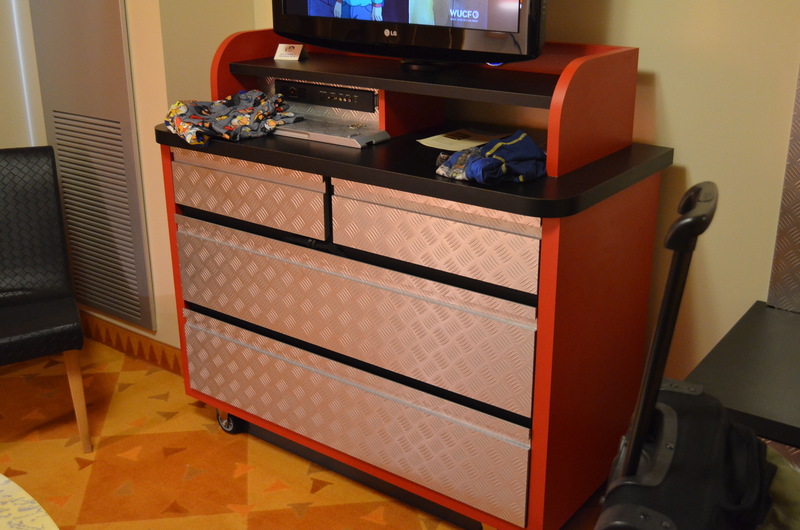 Inside the room, you found a retro-motor-lodge feel, and automotive themed furnishings, such as this chest of drawers. Walking around, you found plenty of photo opportunities. 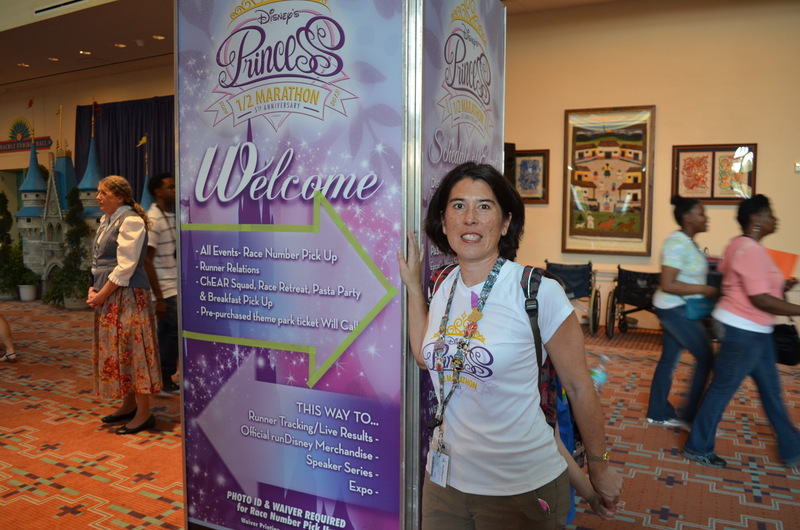 After spending some time exploring the hotel, we headed over to the Fit for a Princess Expo which this year was at the Coronado Springs hotel. Not a good fit — compared to the expo last year at Disney’s Wide World of Sports complex, this year’s expo was incredibly crowded and poorly laid out. It was very overwhelming for my boys, so we didn’t stay very long. 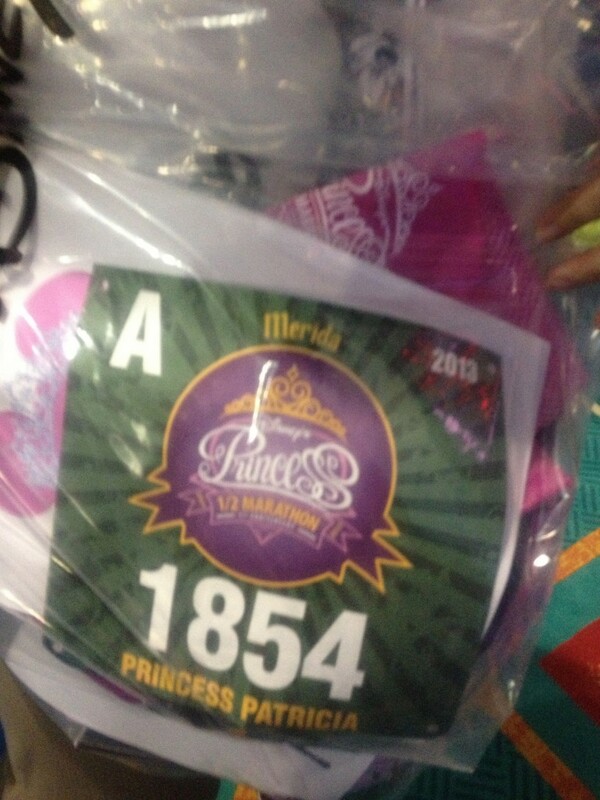 We were there to pick up our runner number bibs, t-shirts and a Dooney and Bourke purse I had pre-purchased. Dave looked for and found a running belt, which you use to carry your phone, snacks and ID. We left as soon as Dave found that, but the lines for the buses to leave the expo were outrageous! We were in line about 45 minutes, that wait became worse over time. At the Fit for a Princess Expo. 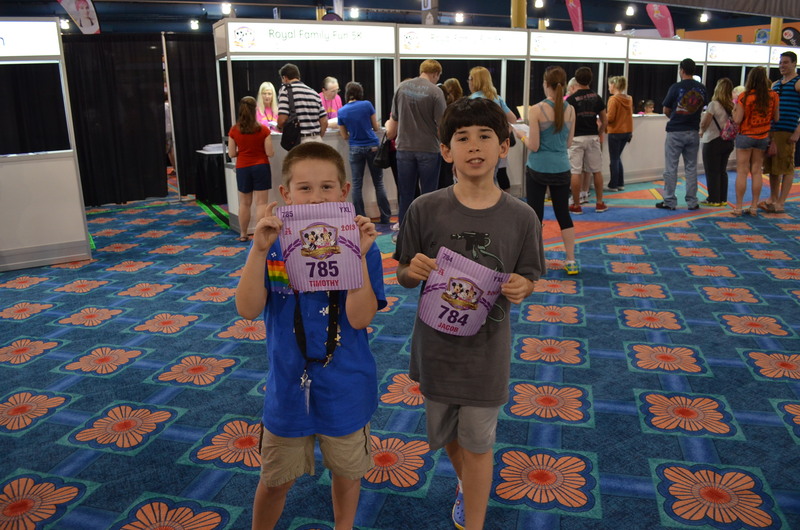 The kids were excited to get their 5K runner numbers. And I was VERY excited to get mine for the 1/2 marathon! 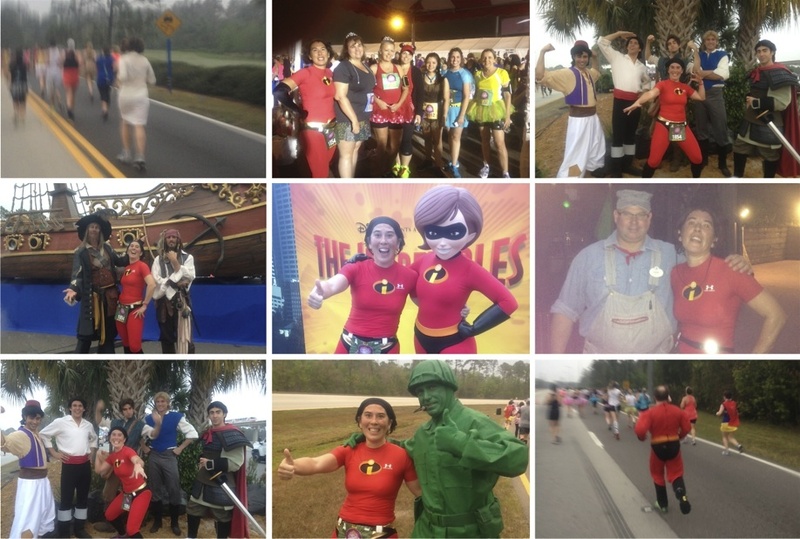 On Saturday morning, we awakened bright and early so we could catch the 5:30am bus to the 5K race start location at EPCOT. 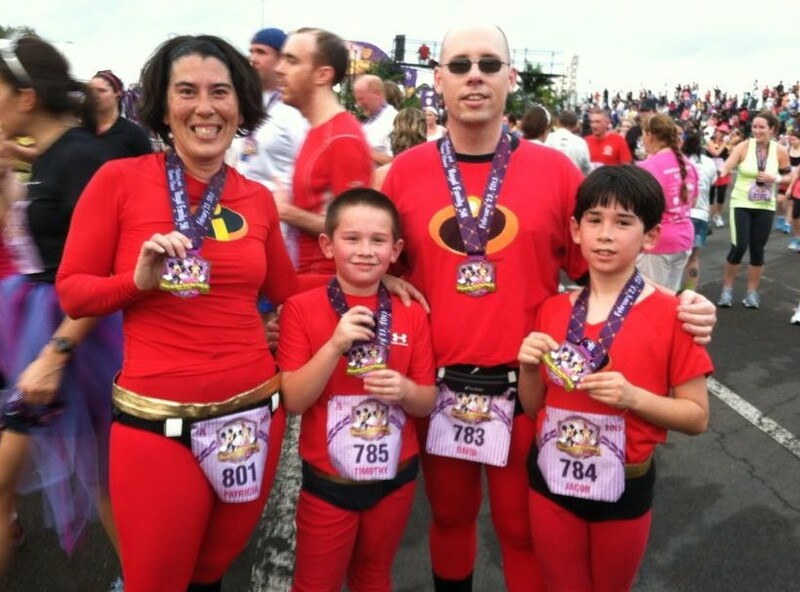 I remember the applause we got walking to the bus stop area in our matching Incredibles outfits. I didn’t take any pictures of us during the 5K, but someone took this nice one of the family after we were finished. Jacob was like a little lightning bolt and I was working hard to keep him in my view during most of the race. Dave and Timmy stayed together and Dave was so proud of Timmy’s stamina – he only stopped once to walk out a cramp. After the Royal Family 5K. We went to Sea World after the Royal Family 5K (that’s for another post) and came back pretty tired from a long day. 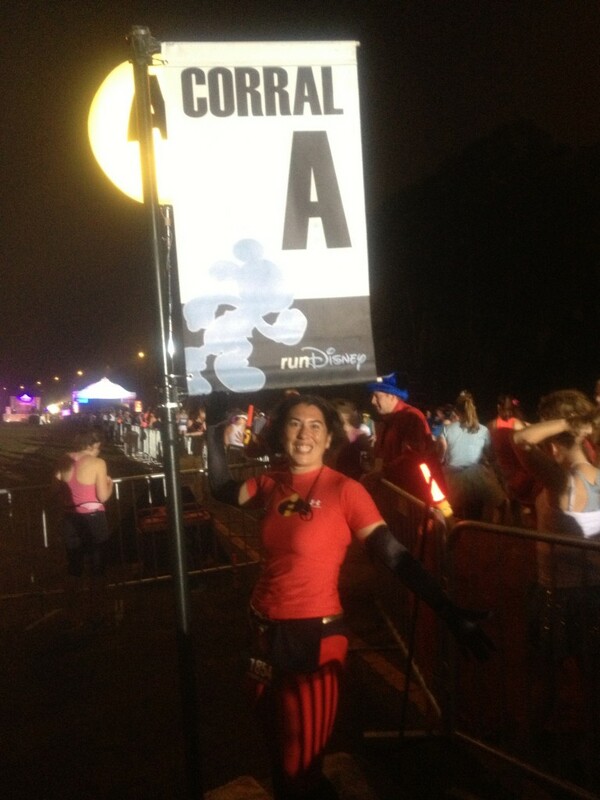 But I had to awaken at about 3am Sunday morning for my bus to the 1/2 marathon starting point. 3am comes really early! 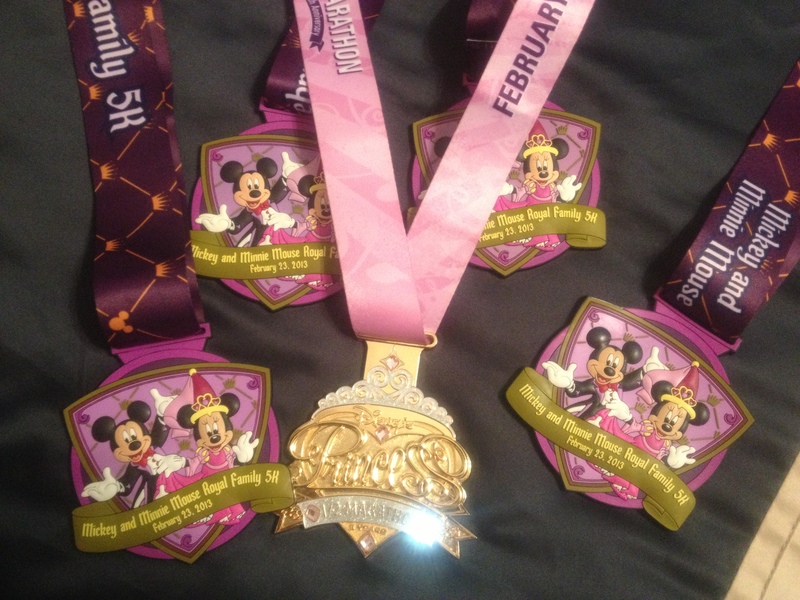 I worked incessantly with the fabulous ladies at a Disney Princess Half Marathon discussion board on Facebook about where and how my sons should travel to watch me during the race. There was a lot of spectator experience on the board, and Dave and I were able to work out a plan. 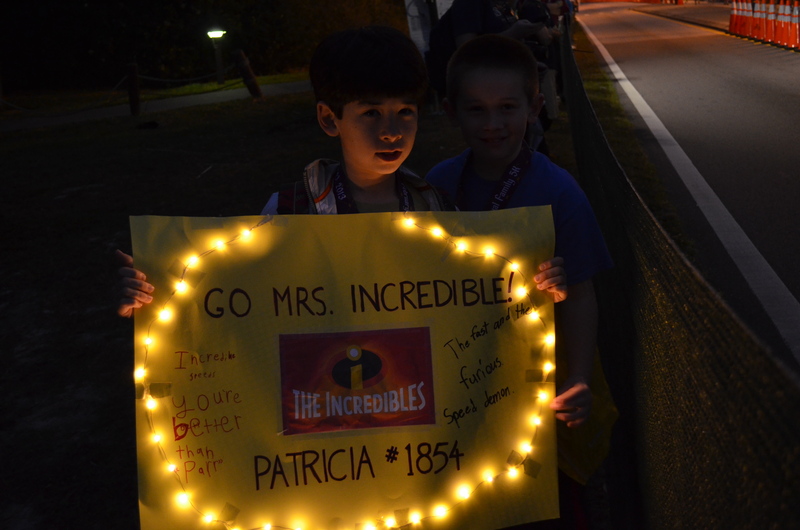 The boys made me a wonderful poster, and even put battery-powered LED lights around it so it could be seen in the dark…my first 90 minutes of the race was in the dark. Another thing the boys had to help keep tabs on me: the Find my Friends app on the iPhone. We don’t use it often, but on Sunday we turned it on. It was indispensable for Dave and the boys — they could easily tell where I was on the course, and whether they were ahead of or behind me. In fact, Dave was even able to see me on the course while they were on the monorail! Unfortunately for me, I had planned on temperatures in the 50s for this costume. 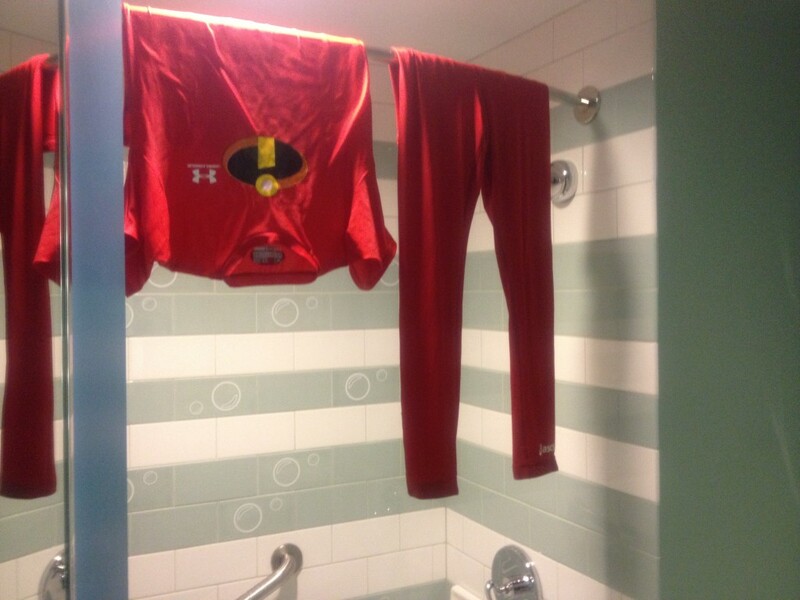 Long sleeves, gloves, long pants, leg compression sleeves to look like Mrs. Incredible’s boots. With a low of 68F forecast, I had to quickly come up with some modifications. First things first, I had to wash what was worn for the Family 5K that would be re-worn the following day. I opted for Timmy’s short-sleeved shirt, which turned out to be a great choice. It was very form fitting, and therefore didn’t chafe the way Jacob’s looser short-sleeved shirt would have. I was in Corral A like last year. 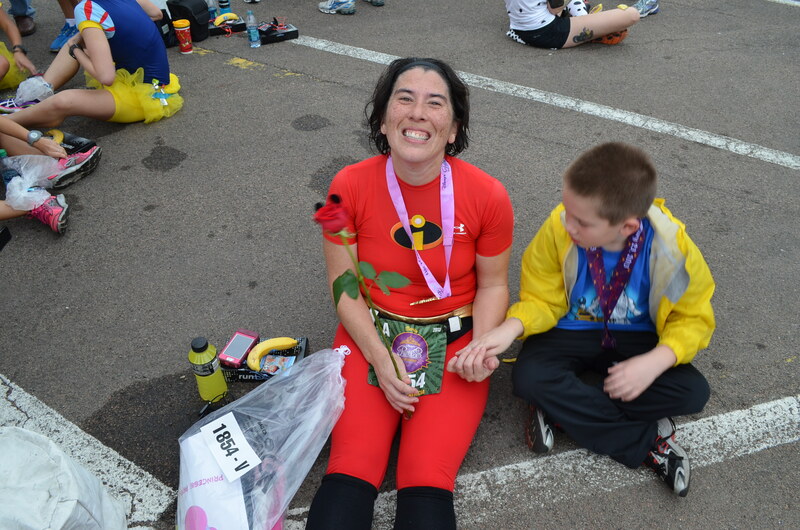 Although I certainly didn’t deserve it, I finished in a Corral B-type time. 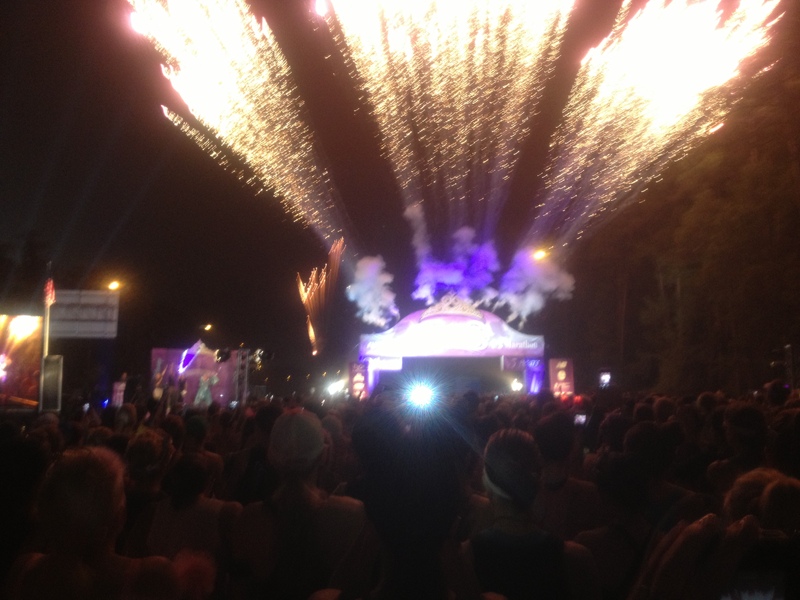 Like last year, the race start features fireworks for each of the 8 corrals. Each corral starts 7 minutes apart. I was this close to the first burst of fireworks, which was pretty cool. My crappy iPhone photo of the castle, as taken from Main Street, USA. You can see a much better one here, courtesy of the Walt Disney World Facebook page. Dave and the boys opted to skip the viewing opportunity at Main Street USA in Magic Kingdom and instead parked at EPCOT, and then took the Monorail to the “Ticket and Transportation Center” which is essentially the Magic Kingdom parking area. 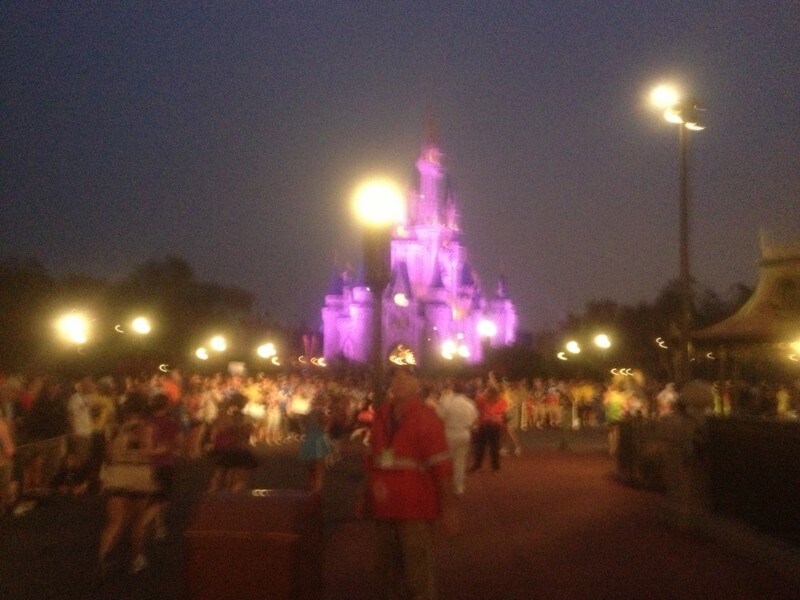 They were able to see me run northbound at Mile 4 without the same crowds as Magic Kingdom. Dave was able to text me where he was standing, and I could see the light-up sign perfectly. I love this sign so much! Thanks boys! 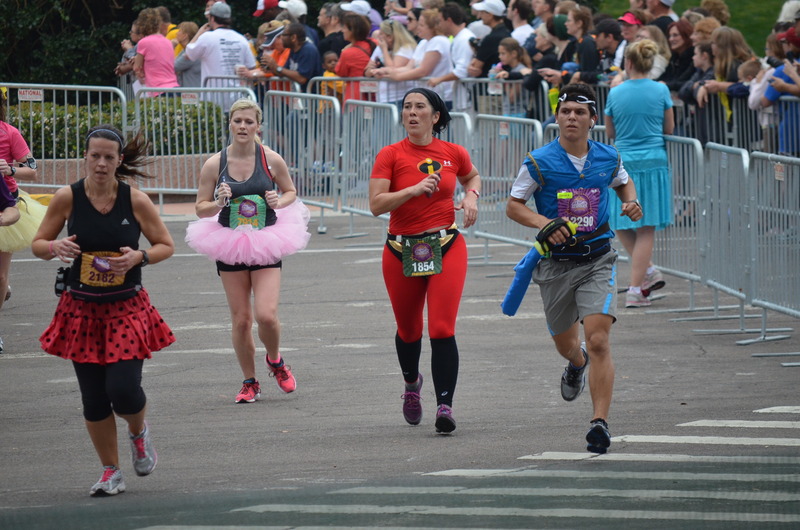 The second place the boys got to see me was around Mile 7 at the Polynesian Hotel. They stood along the east side of Floridian Way, although I was running southbound on the west side of the street. 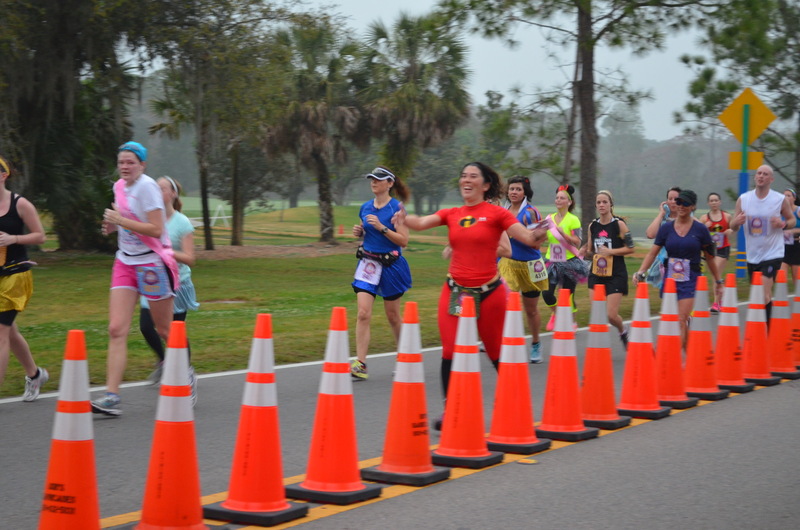 Another runner was hit by a car when she hopped across the cones to get photographed. I’m glad I didn’t think to do that! Dave then hauled the boys to the monorail at the Polynesian and took it back to the EPCOT parking lot. They found a spot just before the finish line to catch more pictures of me. This time Dave used a telephoto lens. The last curve before the finish line. By the way, all men in this race had to start in Corrals C or further back. So I had a 14 minute head start over any male, and was passed by many. Not the most flattering picture but it gives you an idea of how wonderful our new camera is! I saw my boys at each of the three locations, and blew them kisses each time. Getting to see them meant the world to me and made a difference in my attitude about Sunday’s experience. It was so much warmer than in 2012, and much more crowded as well. The boys brought me a really cute rose with Mickey ears in them. Timmy was very tired from all the walking he had been doing the past two hours. 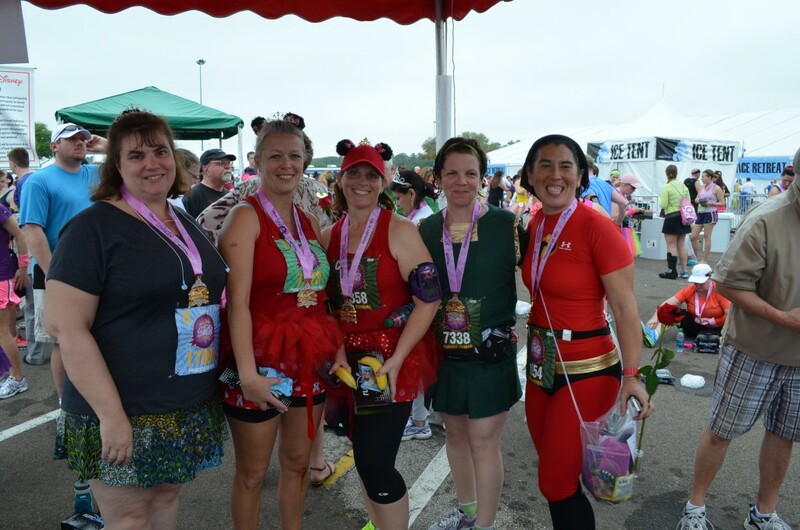 Here’s the group of girls from the Hurlburt Spouses’ Club (except one who we couldn’t find), we all rooted each other on during training and it was great to be there for when they crossed the finish line! I am incredibly grateful that my family came with me and woke up super early to see me on the course! That was a first, and I assured the boys that I wouldn’t ask for it again unless I got into, say, the Boston Marathon <laughing hysterically>.